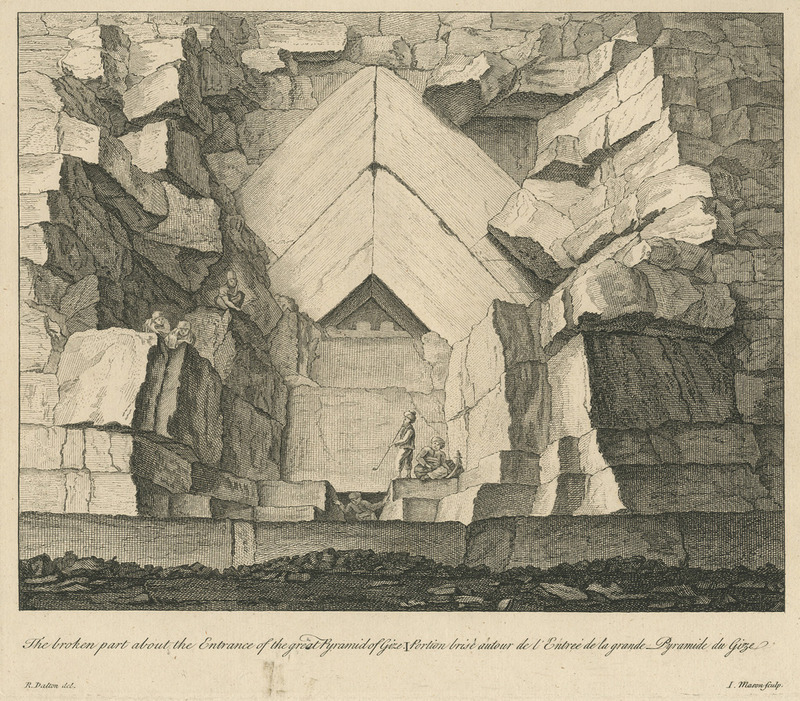 The triumphal arch of Marcus Aurelius in Insine (modern-day Sheikh Abadi). 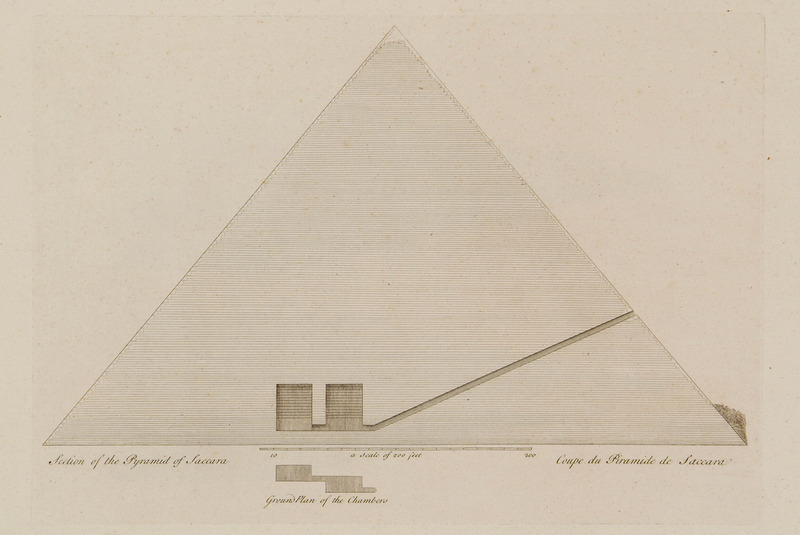 The Great Pyramid of Giza. 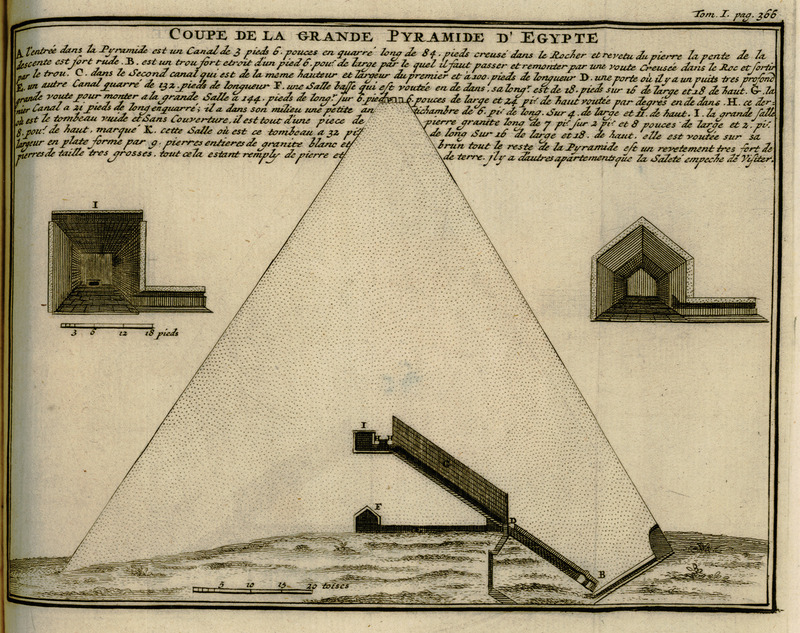 Entrance to the Pyramid of Cheops at Giza. 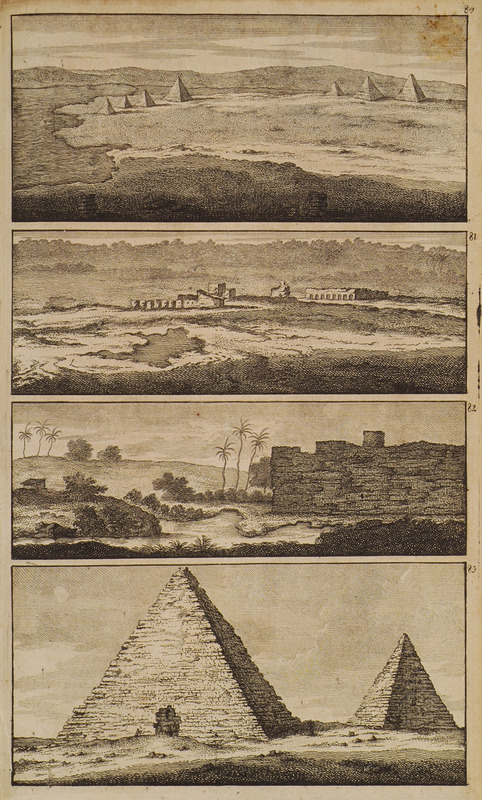 Table showing the evolution of pyramid structures: Primeval Mound, Pyramid of Saqqara and Pyramid of Giza. 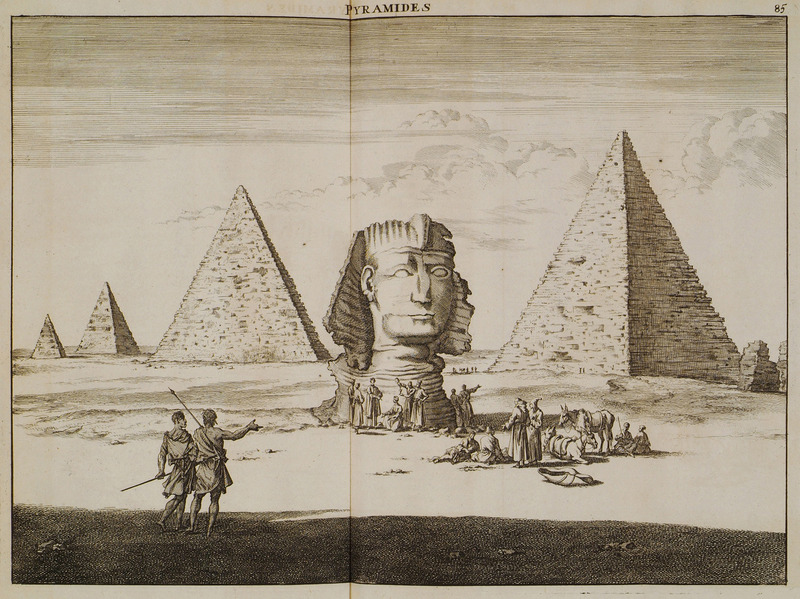 The Pyramids of Giza and the Sphinx. 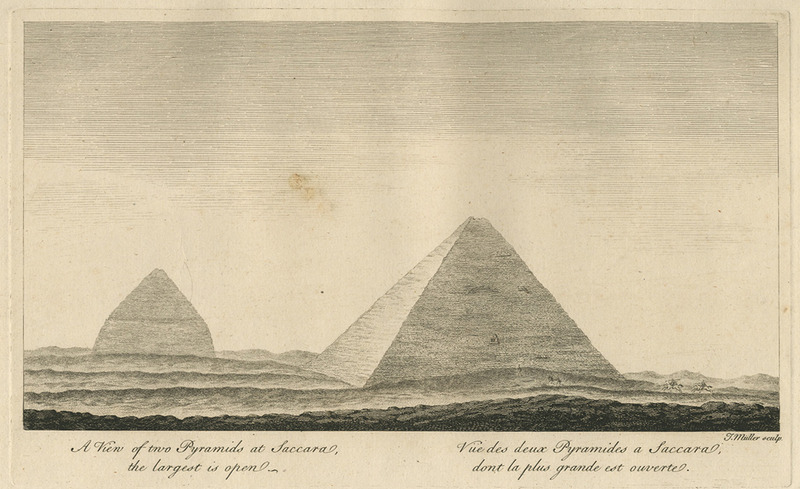 The Pyramids of Ghiza from the north. 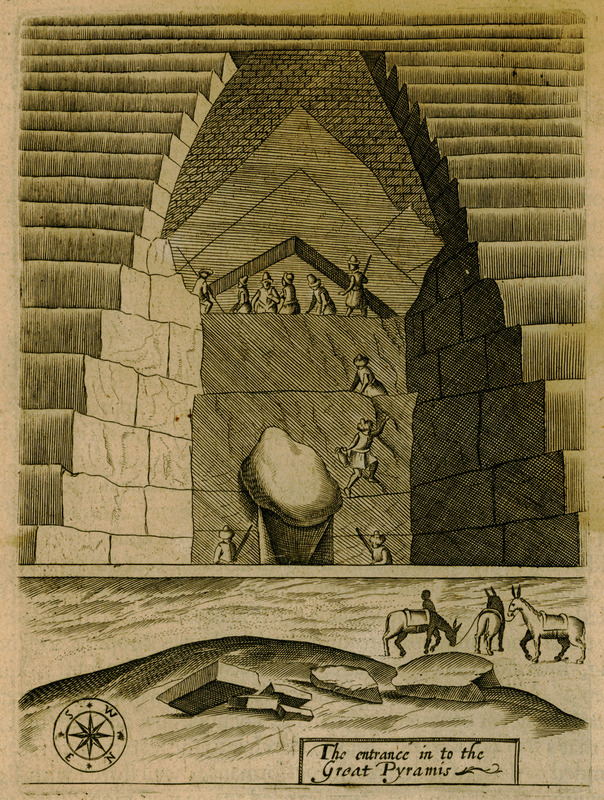 The entrance of the Pyramid of Cheops. 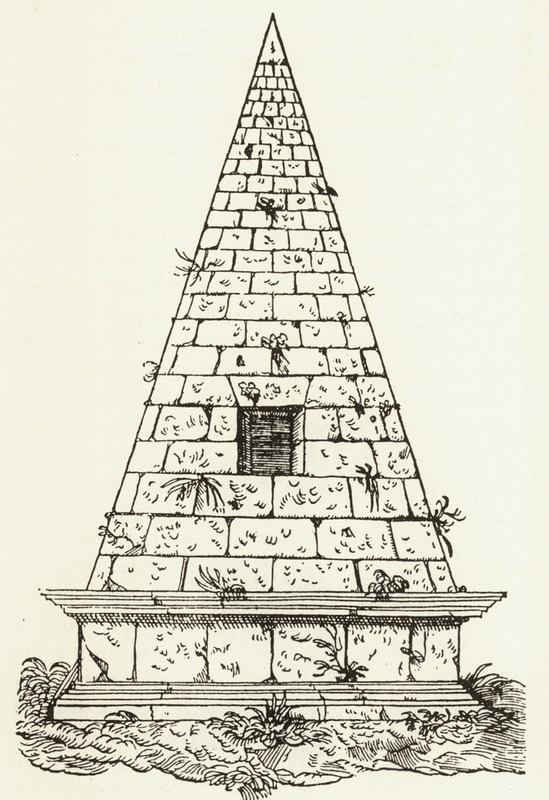 Section of the Pyramid of Cheops. 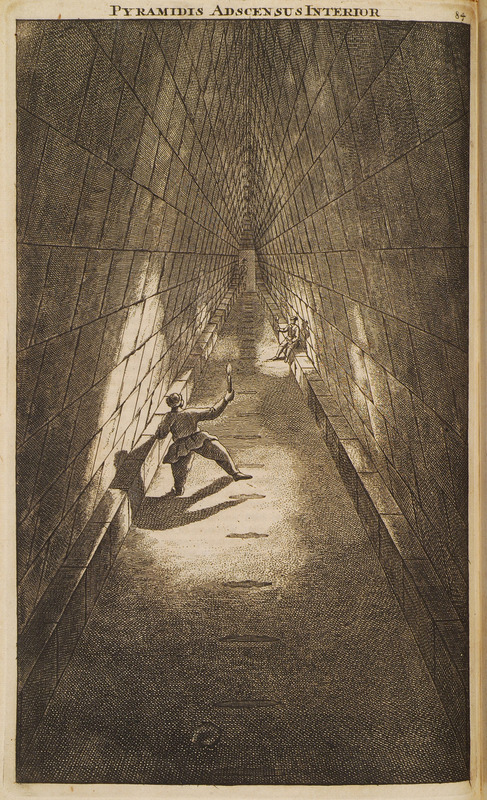 Interior of the Pyramid of Cheops. 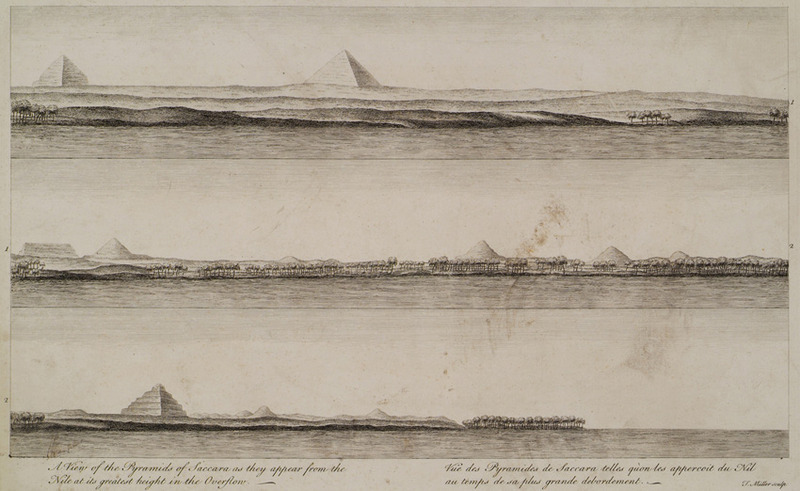 View of the Pyramids of Saqqara from the Nile, at the time of the Nile floods. 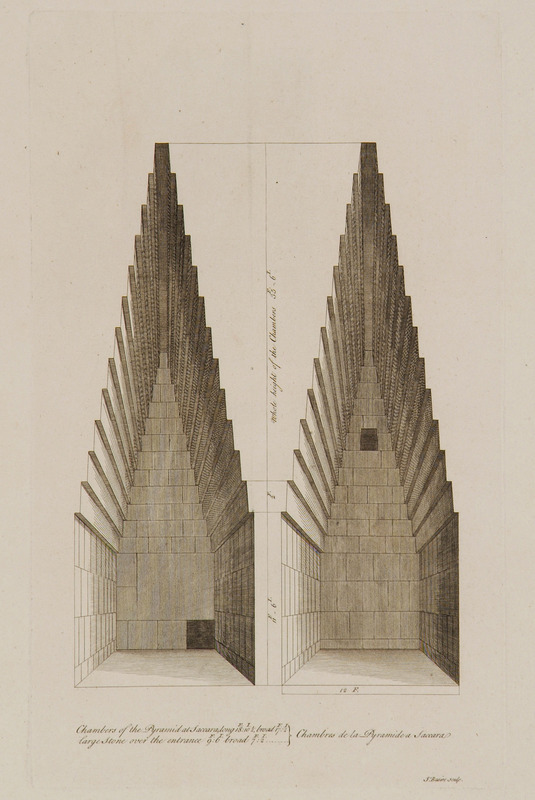 Section of Pyramid in Saqqara. 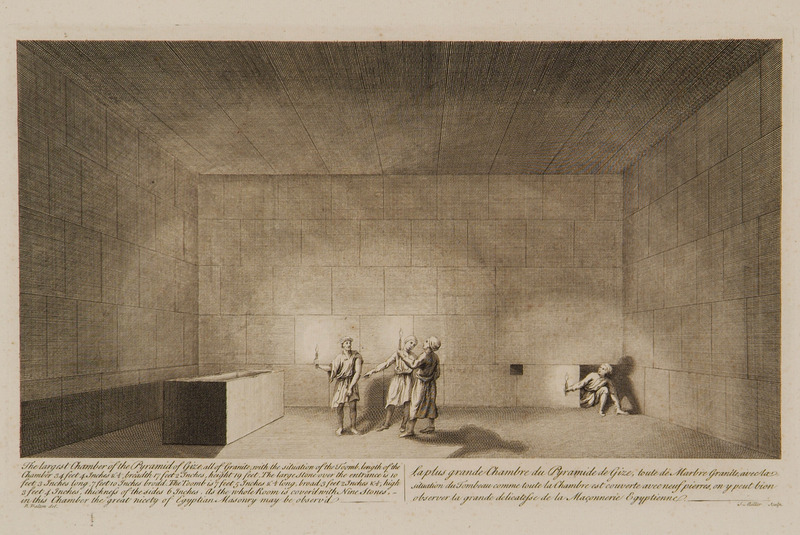 Burial chamber in the Pyramid of Saqqara. 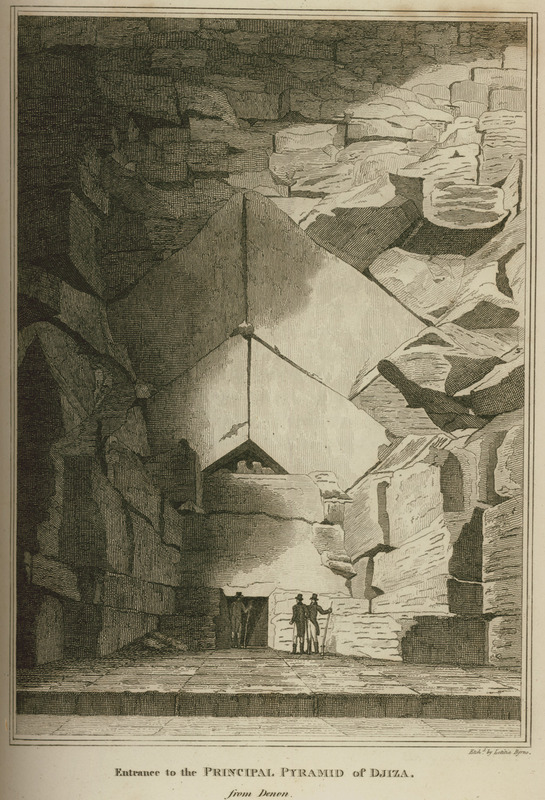 The burial chamber of the Pyramid of Cheops in Giza. 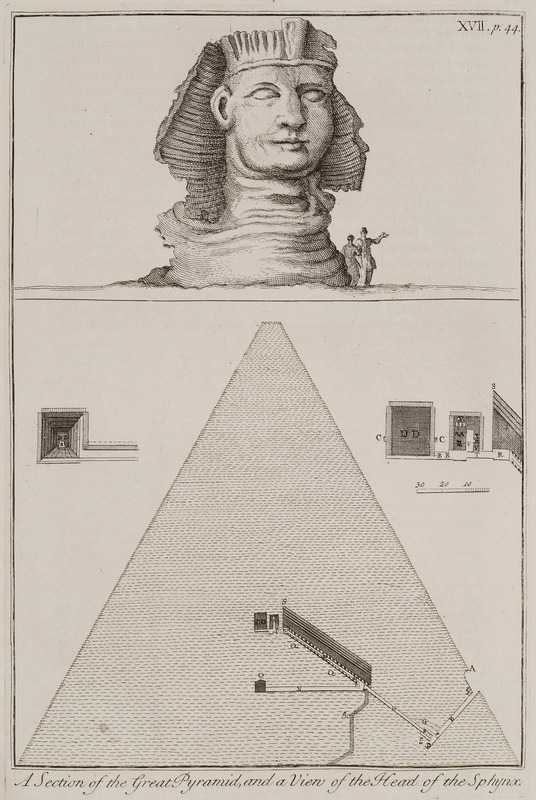 The entrance to the Great Pyramis. 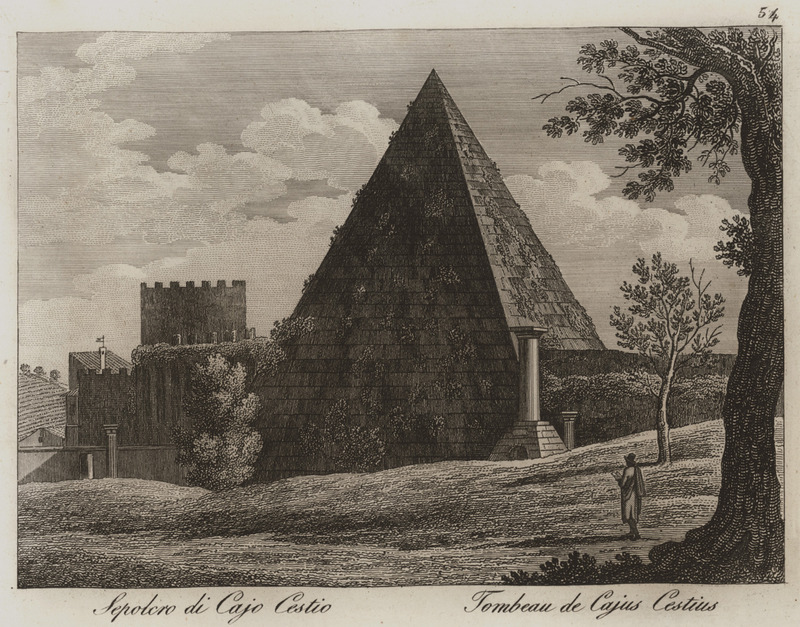 The Pyramid of Gaius Cestius in Rome. 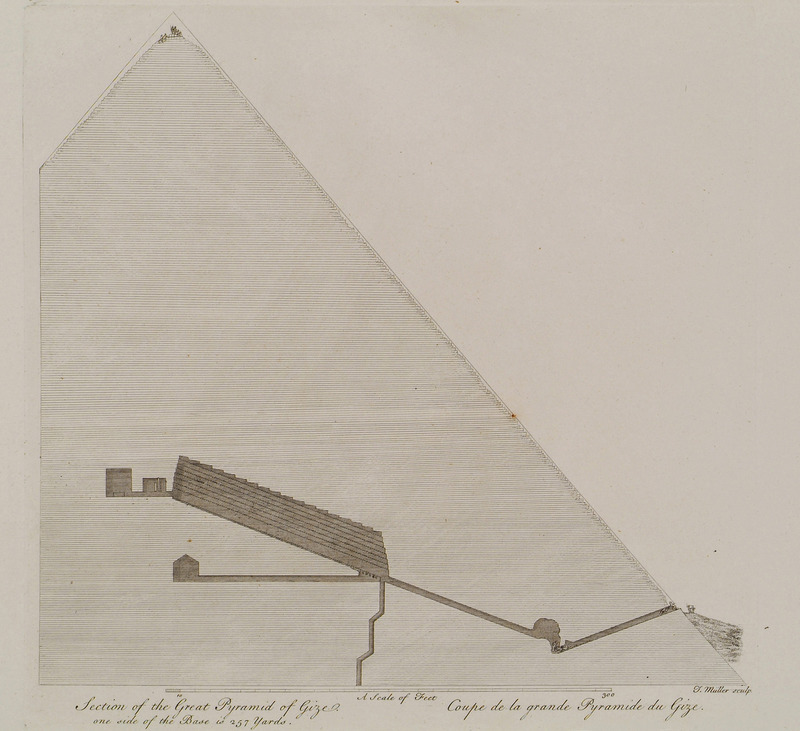 Section of Cheops Pyramid in Giza. 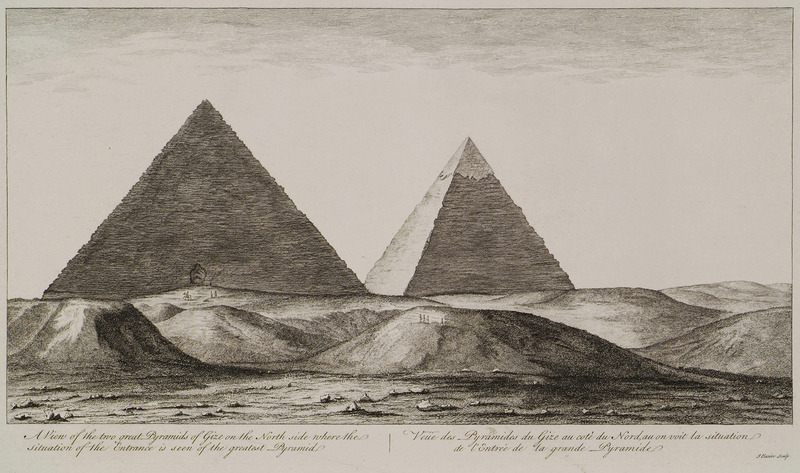 View of the Pyramids at Giza. 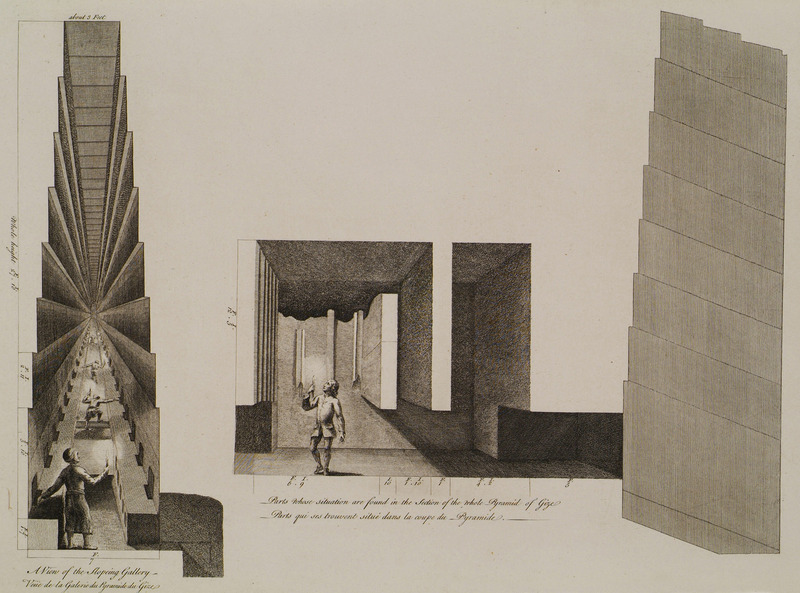 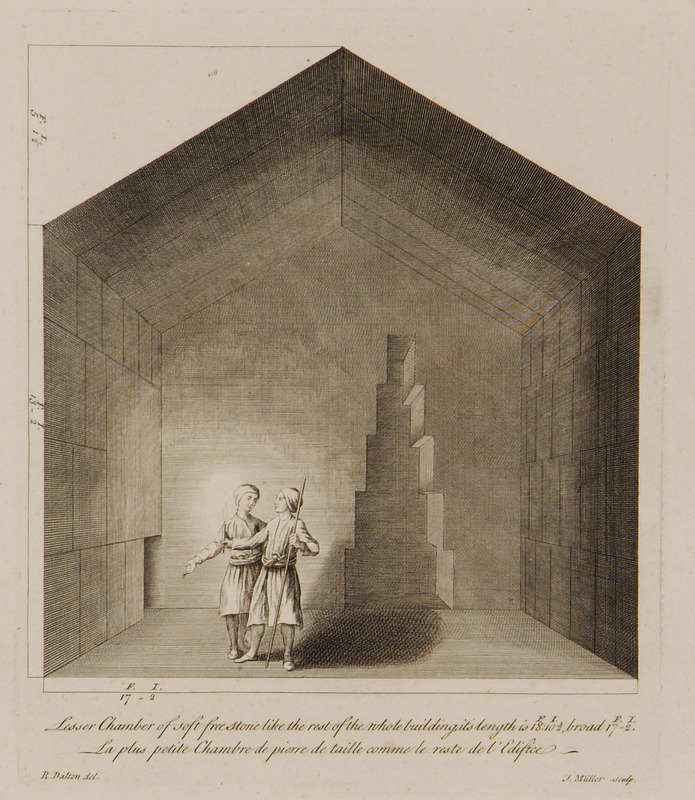 Plan and section of the hallway of the Great Pyramid of Giza, also known as Pyramid of Cheops. 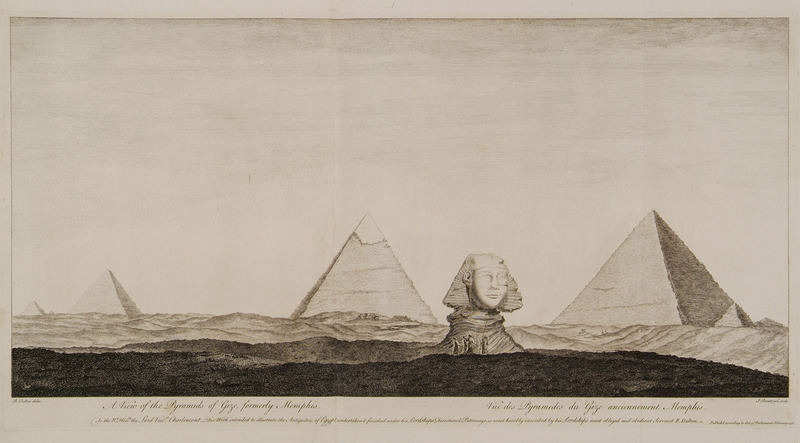 View of the Sphinx. 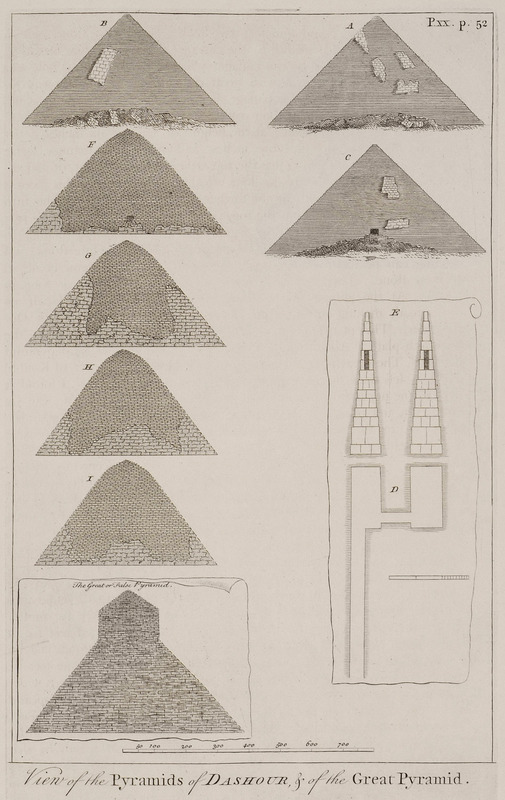 Section plans of the Great Pyramid of Giza, also known as Pyramid of Cheops. 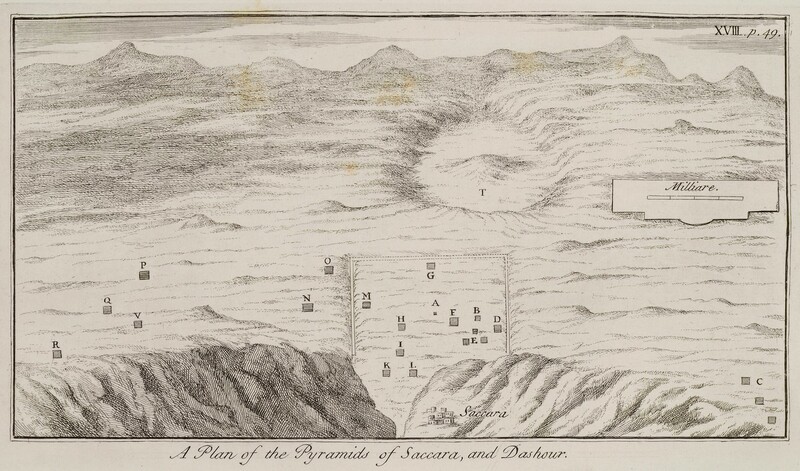 Map of the Pyramids of Saqqara and Dahshour. 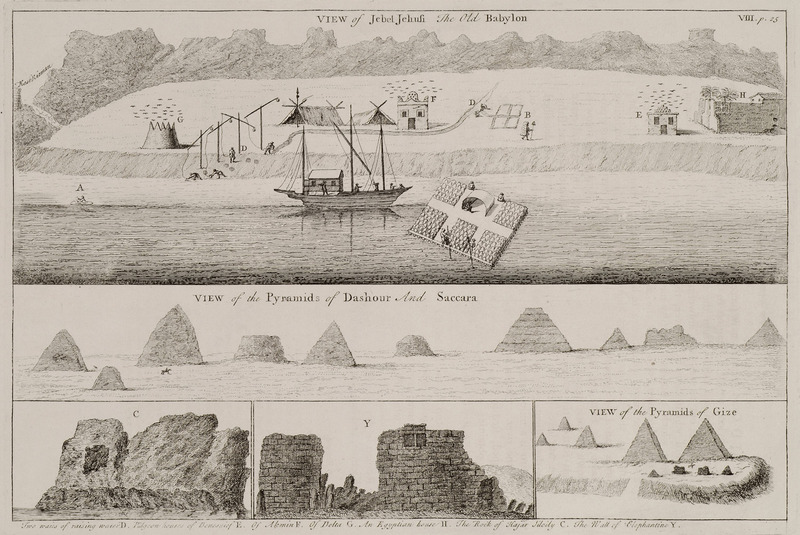 Views and section plans of the Pyramids of Dahshour. 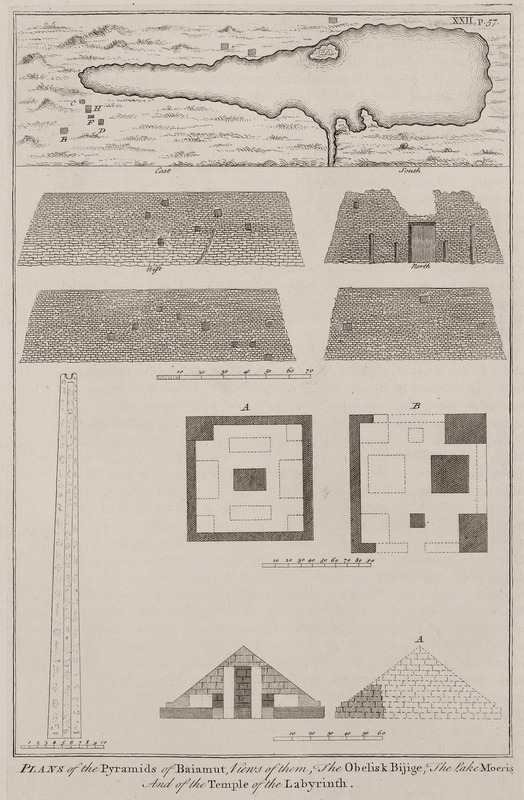 Plans and views of the Faiyum region. 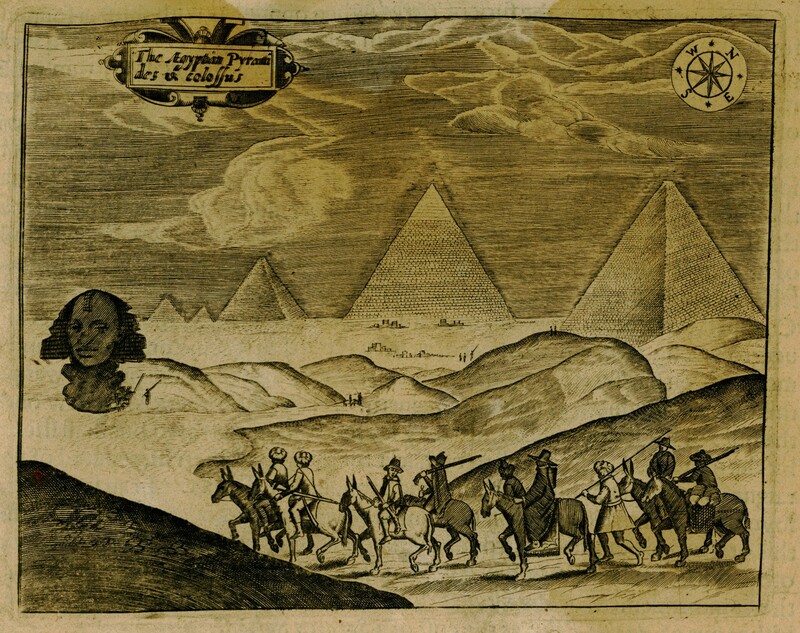 The lake Moeris. 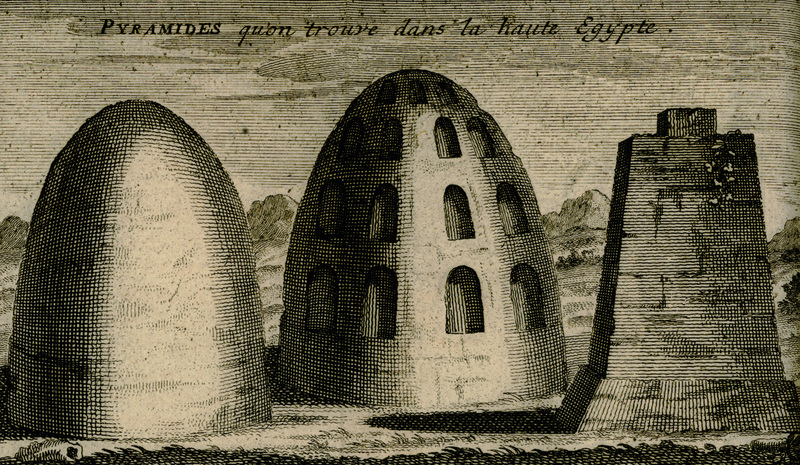 The Meidum or Maidum Pyramid, south of Cairo. 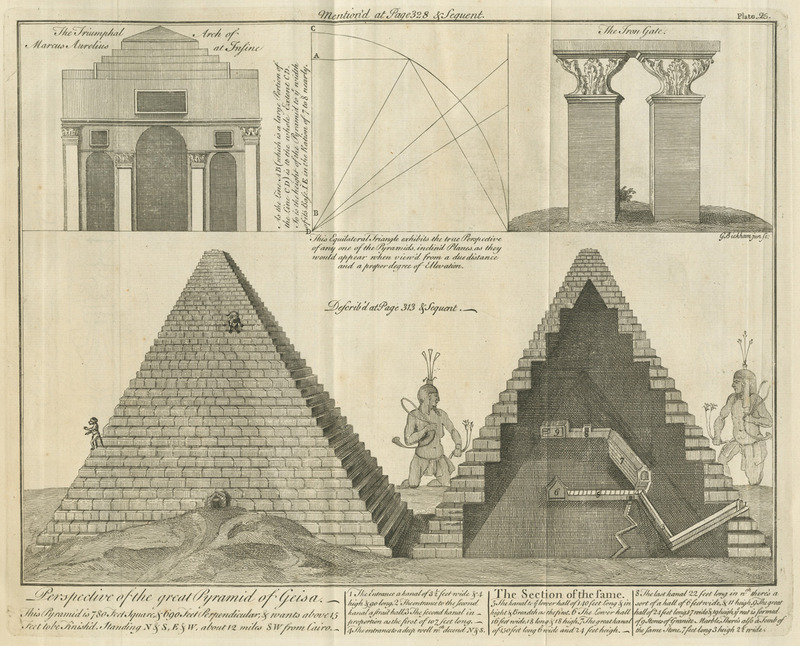 Due to its unusual shape it is also called as False Pyramid.